I found this coat of arms on Peter's Street in Canterbury, near where it becomes High Street. It caught my attention because it really does do all of the things that a coat of arms should do: it's simple, easily identifiable, and it tells you a lot about the bearer. In this case, you can tell right off the bat without knowing anything else that the shop there is French and presumable sells baked goods in addition to its role as a place to eat. I'd blazon those arms as: Tierced per pale azure, argent, and gules two baguettes in saltire proper. Well, technically, is the arms of the Cathedral Chapter of Canterbury Cathedral, which arms are also used by some closely related entities, such as The King's School (said to be the oldest continuously operating school in the world, having been founded in 597 A.D. by St. Augustine). In any event, this coat of arms is to be found on and around the Cathedral in Canterbury, in several different media: painted on wood and metal, carved in stone, cast in metal, and painted/printed on a flag. The arms are blazoned variously as: Azure on a cross argent the letters I/X sable and Azure on a cross argent the letter X surmounted by the letter i sable. The arms were recorded by the College of Arms during the Visitation of Kent in 1619 (400 years ago! ), where they are listed in the heading as "Canterbury: Dean & Chapter" (with the text giving the full name as "the Denery & Chapter of the Cathedrall church of Christ in Canterbury") and blazoned as: Azure on a cross argent a Roman letter X surmounted by the letter I sable. Some accounts say that the letters on the cross are Greek (iota, chi) and stand for the initial of Jesus Christ. Others say that they are an abbreviation of Christi, and thus properly chi, iota; hence the lower case "i" in some versions. The Canterbury Cathedral Shop has a very nice selection of souvenirs, mementos, artwork, etc. all available for you to buy. All in all, a fine display of these arms, having been in use for more than 400 years, having been recognized by the College of Arms in 1619. In the small square immediately outside the gate to the grounds of Canterbury Cathedral stands a memorial "Dedicated to the honoured memory of the men of Canterbury who fell in the Great War 1914-1919"
Each of the four sides bears the image of a soldier, sailor, etc., as well as a coat of arms relevant to the city and county. The third side bears the image of a pilot of the then Royal Flying Corps, and the arms of Edward of Woodstock, son of King Edward III, the "Black Prince" (1330-1376), who is buried in Canterbury Cathedral. This side of the memorial also bears four other smaller shields, with the floral emblems of (top to bottom, first left and then right) England (a rose), Wales (a leek), Scotland (a thistle), and Ireland (a shamrock). The fourth side of the memorial bears the image of a sailor, and the arms of the County of Kent. I found it a touching armorial tribute to the men of Canterbury who lost their lives in the service to their country during World War I.
Kent College in Canterbury is a co-educational independent school for boarding and day pupils between the ages of three months and 18 years. It was founded in in 1855 as the Wesleyan College, Canterbury, and in 1920 was acquired by the Board of Management for Methodist Residential Schools. It sits on a 70-acre tract on the edge of the City of Canterbury. But, of course, what caught my attention was the school's coat of arms, which by incorporating elements from both the City of Canterbury and the County of Kent, allows you to identify its location without knowing anything else about it. I would blazon the arms as Gules a demi-horse couped forceny argent on a chief or three Cornish choughs sable, with the crest A pair of ostrich plumes argent charged with a Cornish cough sable. The motto is Lux tua via mea (Your light is my way). I thought it was a nicely designed coat of arms - simple, and readily identifiable - that is certainly evocative of its location in the City of Canterbury and the County of Kent in England. Following our week in Arras, France, we hopped aboard the Eurostar train and took rode through the Chunnel (the Channel Tunnel) to London and then on to Canterbury in the County of Kent, England, where we spent several day wandering about the town and visiting with friends. We had decided to return to Canterbury on this trip, because the last time we were there, we only had a day in Kent, and spent it visiting three parish churches - one in Sandwich and two in Canterbury - where I had ancestral ties. As a consequence, we had no time at all for the primary tourist attraction in the city, Canterbury Cathedral. So we decided to make up for that this time, and in addition to visiting a lot of the city within the old city walls, spent the better part of a full day at the Cathedral. Naturally, I was looking forward to seeing what heraldry could be found in and around the city. I already knew that the Cathedral itself was chock full of coats of arms (some of which I'll get to in a later post), but I wanted to see what other uses of heraldry could be found. And I was not disappointed! The arms of the City of Canterbury (Argent three Cornish choughs proper on a chief gules a lion passant guardant or) were, according to the website Heraldry of the World, first registered at the College of Arms in London in 1619 (exactly 400 years ago! ), but they appear on official documents as early as 1380. 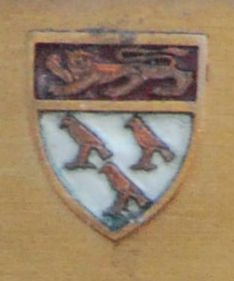 The birds are taken from the arms ascribed to Thomas Becket, and the lion and chief denote Canterbury's status as a royal city since the 6th Century. The motto is Ave mater angliæ (Hail Mother England). This cast iron box and post are marked "Canterbury Corporation Electricity Supply." This brass plaque marked the entrance to the Westgate Gardens (just a block down from our hotel, which was just outside of the west gate to the old city). All in all, the City makes a good display of its civic arms, and it was fun to run across all of these versions of it. Following the several days of the Congress in Arras, France, we signed up for an all-day excursion to some of the World War I battlefields and sites in the area. In this specific instance, at one end of the smaller room that we were in were some heraldic flags. The central flag is, of course, the national flag of France. The flag to the right (I got someone to take pictures while I held out the flags to see them better) contains the arms of Picardie (or Picardy, as we spell it in English), an historical territory and former administrative region of France. (It is now a part of a new region of Hauts-de-France.) Quarterly: 1 and 4, Azure three fleurs-de-lis or; 2 and 3, Argent three lions rampant gules. The other flag is that of the Department Nord, created from the western halves of the historic counties of Flandre (Flanders) and Hainaut, and which uses the arms of Flandre, Or a lion rampant sable armed and langued gules. What a nice display of armory to go with a very pleasant lunch!